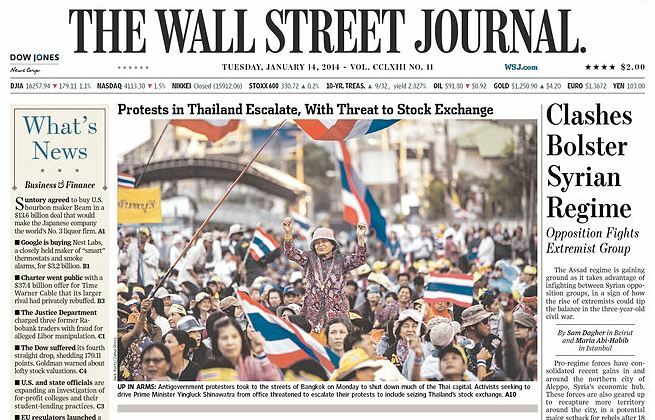 The front page of the Wall Street Journal from Tuesday, Jan 14, with my photo as "main art." The protestors' plan to shutdown Bangkok started late Sunday, a few hours earlier than planned, and kicked into high gear Monday morning. Like most of the journalists in Bangkok, I went out early (6AM) with a very loose plan to visit the protest sites. Calling it a "plan" though is really gilding the lilies. The plan was to be out on the street and see what happens. We knew protestors would shut down central Bangkok by blocking important intersections but we didn't know if there would be violence (I didn't think there would be but I carried a helmet and gas mask just in case) or how city residents would respond. I packed pretty light for Monday. I knew I would be moving around a lot and probably walking a lot and that in addition to camera gear I needed to pack my helmet and gas mask. I carried two bodies and two lenses (my 16-35mm zoom and 70-200mm zoom), a 2X teleconverter, one flash and a bunch of memory cards. I met a couple of other photographers at Asok BTS station, we sort of refined our plan a little and then started photographing. I made the picture above in the first hour of being on the street. After working in Asok for a little bit, we took the BTS to Victory Monument, then to the main stage at Pathum Wan then back to Asok then home. We didn't need to worry about our safety. There was no violence and people treated the whole thing like a giant street fair. 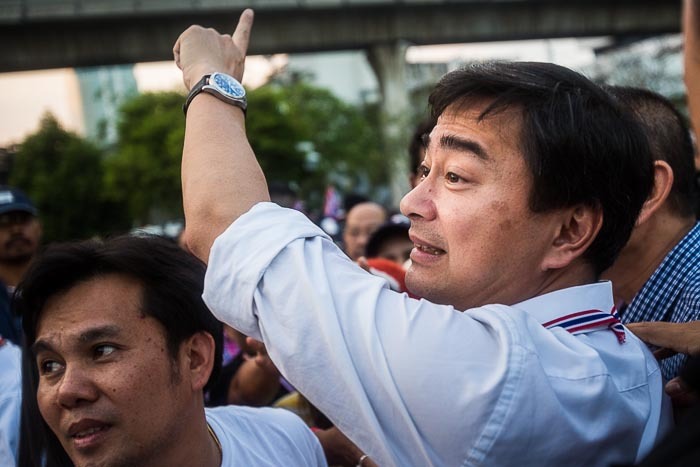 Former Prime Minister Abhisit Vejjajiva walks through the crowd at the Lumpini protest site. All together, I filled three 8 gigabyte Compact Flash cards. I got home about 1PM and quickly edited the morning stuff and sent the photos to ZUMA which distributed them to newspapers and magazines. Then I went back out for the evening and went to the stage in Lumpini Park, where I ran into former Prime Minister Abhisit Vejjajiva, now a leader of the anti-government protests. He got a hero's welcome when he walked through the crowd. After a couple of hours in Lumpini it was back to my apartment to file a second set of photos to ZUMA. It's nice seeing my picture on the front page of one of the leading newspapers in the US. Honestly, I was very surprised to see it - there were tens of photographers out photographing Monday and hundreds of pictures moved on the "wires" (AP, Getty, Reuters, AFP, etc). It's not my favorite photo from the day, but it is one of my photos that best sums up what the day was like. I made this picture during my second outing in the afternoon. I like this one more than the one the WSJ used, but the top one probably sums up the story better. 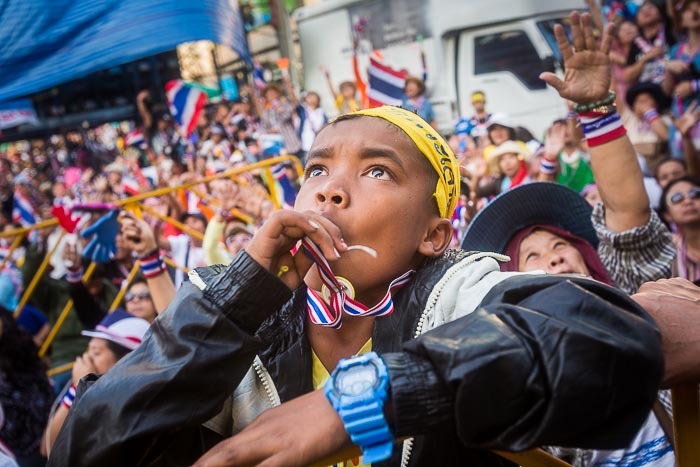 There are many more photos from Shutdown Bangkok in my archive or available from ZUMA Press.